It might have been the least Purple Prince-related event during this unofficial Prince Week, but there were lots of music lovers sporting his glyph and color on Wednesday night at the Dakota Jazz Club. 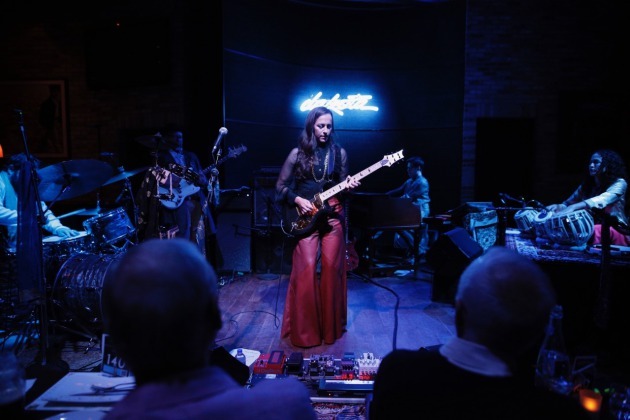 The attraction was Donna Grantis, the guitarist in his last band, 3rdEyeGirl, and her all-instrumental jazz band. She debuted the group last August at the Dakota (where coincidentally 3rdEyeGirl made its debut with Prince in January 2013). While an album sits in the can waiting for release, Grantis decided to do another live show at the Dakota. The guitarist had a couple new numbers, a different drummer (Jason Thomas of Snarky Puppy instead of the Twin Cities’ own JT Bates) and increased confidence. Not that she was lacking any last summer. There was only a hint of Princely stylings in this intense and sometimes gorgeous instrumental stew, but there were nods to Jeff Beck, Carlos Santana, Mahavishnu John McLaughlin, Jimi Hendrix and other guitar greats -- all with an East Indian undertone thanks to tabla player Suphala. The arrangements featured occasional call-and-response exchanges between Grantis and keyboardist Bryan Nichols and plenty of solo time for both. Her passages were substantial enough to be involving but not long enough to be indulgent. A passionate but unshowy performer, Grantis used an ebow on “Mr. Majestic” and different effects pedals on other numbers. With her simpatico players, the guitarist created a sumptuous swirl of sound. She even dialed it down. Evoking ripples of water in a Minnesota lake, “Laelia” might have seemed like a New Age piece to some listeners, but in this context it was a thing of crystalline beauty. After that quiet interlude, the group tore into Santana’s 1970s nugget, “Batuka,” an explosive number with a more fully arranged feel than Grantis’ own compositions. Things got a little funkier on the final two selections, “The Future Is…” and the encore “Elsa” but not like Purple funk. This was a Grantis groove. The performance left no doubt that the Toronto-reared, Minneapolis-based Grantis, whom Prince discovered on YouTube, is one serious player -- and now a skillful bandleader.